As you may have seen back when I dug out all of my old pins that used to cover my Levi's denim jacket back in the late 80's, among other ridiculous "flair" there were two Beastie Boys appearances. In addition to the buttons, take a look at this video from VH1's Hip-Hop Honors a few years back. If you can get past the first few minutes of Puffy Diddy P Daddy Diddy Combs, Mixmaster Mike does not disappoint and then the 2:45 mark in the video brings a performance from the Boys themselves. Hold on until 4:53...you old school fans'll lose your minds. 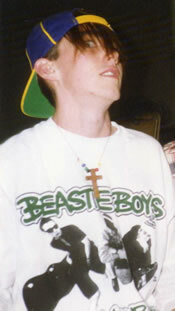 How could I talk about Beastie Boys shirts without mentioning the one I probably wore more than any other? 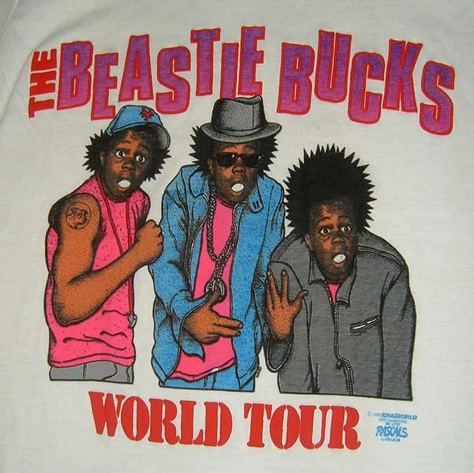 On a family vacation in 1987, I purchased a t-shirt that combined Beastie Boys style, Buckwheat, and all-around sixth-grade hilarity. 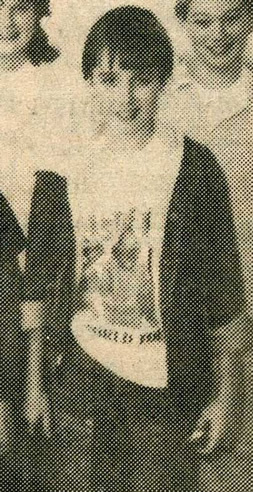 In late 1987, I was pictured in the local newspaper for some sort of award -- of course, I was wearing the shirt that would make any parent proud. This shirt is obviously long-outgrown and long gone; but if I could ever run across one of these in an adult size, you'd better believe I'd pick it up in a heartbeat. Digging deep in my closet, you might find a Beastie Boys t-shirt that I wore regularly back in high school. To the left you see the "cool" kid that I was back in 1993. Cool hair. Cool beaded necklace. Cool LSU hat -- backwards, of course. Despite the high levels of stupid in this picture, it's all balanced out by an awesome Check Your Head shirt. While this particular shirt is cool and all, it was a pretty common shirt among early 90's Beastie Boys fans. It wasn't until several years later, 2003 or so, that I came up with my favorite Beastie Boys shirt. Designed by the folks from Manifest Worldwide, this shirt takes a line straight from Licensed to Ill and works it into a subtle t-shirt tribute. While most people would see this shirt and wonder what in the world it means, a true Beastie Boys fan will immediately recognize the reference. I'm not sure. 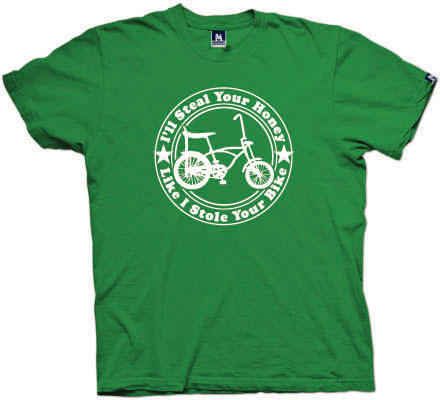 I think my next Beasite Boys shirt may be this one. I realize Record Store Day was over a week ago. I promise that I'll let it go until next year...but not until after this one last post. You see, when I initially posted that Record Store Day was a 2/3 bust, that may have been a little bit premature. As I mentioned, I set out looking for three things on Record Store Day and left my local store with only one of the three -- and that was a copy of something for my brother. But just over a week later, things have changed. This is the one that I was able to pick up for my brother -- a much bigger Black Angels fan than I am. On one side of this 12" is the 2005 Black Angels EP. 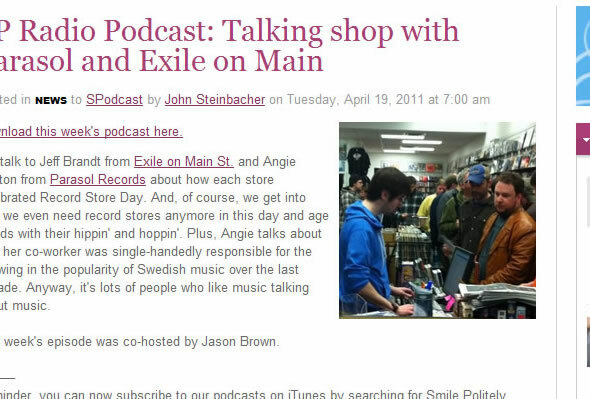 Back in June of 2009, my brother and I were in North Carolina and found our way to a small record store. On that particular rainy night, we shopped for about a half-hour before heading out for a bite to eat at a nearby Waffle House. I left with used LPs from Kristofferson and Jerry Jeff Walker. My brother left with a copy of this EP. So technically, if I wanted to hear this EP I could as my brother has both the original and the Record Store Day vinyl. 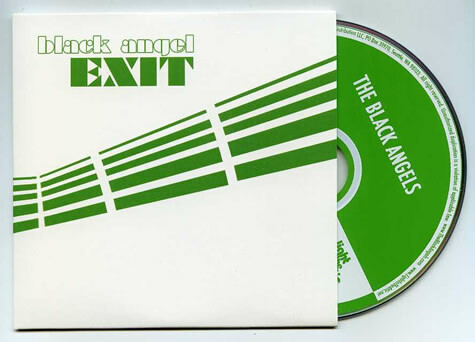 The other side of this release is the 2008 Exit EP. Although the vinyl would be cool to have, I already have the EP on CD from pre-ordering the Black Angels album, Direction to See a Ghost. I call this one a draw. Current score: Record Store Day 1, Me 1. This is another one that I was looking for on behalf of my brother. No luck for me on Record Store Day but a few days ago, my brother was able to find copies of this release left on the shelves at a favorite record store in St. Louis. Besides that, he already had the tracks from this release which he had received digitally with a package pre-order of Phosphene Dream. Again, technically I didn't end up with a copy of this one but I would easily have access to it. Another draw in my eyes. Score? Record Store Day 2, Me 2. While the Black Angels releases would have just been gravy, this Justin Townes Earle 45 was the one thing I wanted for myself on Record Store Day. Unfortunately, as I mentioned last week, my local store received a total of zero copies of this. However, patience is a virtue. 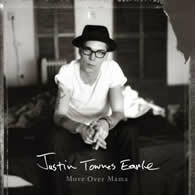 Visiting St. Louis, not only did my brother round out his Black Angels wish list, but he also grabbed one of two remaining copies of the Justin Townes Earle 45. Paybacks I suppose for my efforts a week earlier. 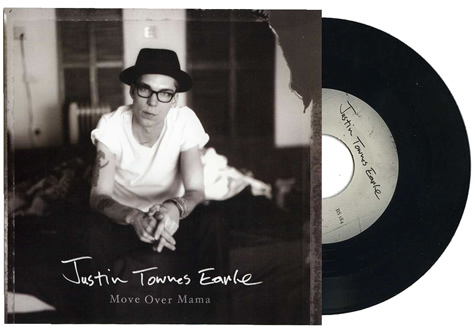 I realize this may seem like a lot of hype over a two song 45 record, but over the past few years, Justin Townes Earle has become one of my favorite performers and I would certainly go out of my way to purchase anything he puts out. This one was a bit tough for me though. I was seeing copies on eBay selling for anywhere from $20 to $50 (although those prices have come down somewhat in the days since). Considering one of the two songs is straight off his most recent album, I wasn't about to pay that price for the one other song (although it is a pretty awesome Springsteen cover). Luckily, in the end, I paid store price for this one -- roughly six bucks. I win this round. Final score: Record Store Day 2, Me 3. Next April we battle again. What looks like Cap'n Crunch but tastes like cardboard? Cap'n Crunch Crunch Treasures. That's what. As a lifelong connoisseur of Cap'n Crunch in its various forms, I couldn't have been more disappointed in this garbage. While Peanut Butter Crunch is by far my favorite, I have always enjoyed a change of pace with the classic Cap'n Crunch, Crunchberries, and even the occasional holiday themed Crunch variations. Coming off the retro packaging of Cap'n Crunch products from last year, I was intrigued by Crunch Treasures when I saw the option of buying a small box for a measly buck. 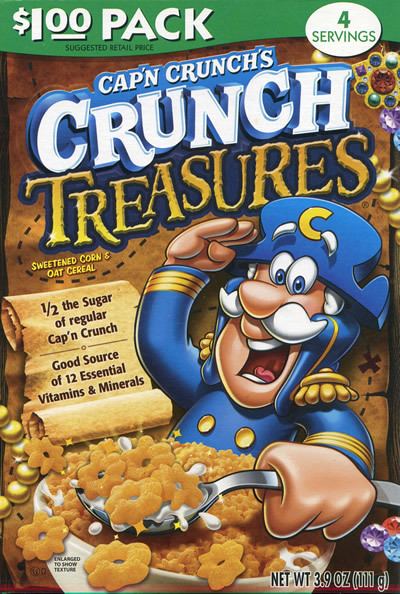 Crunch Treasures is marketed as a less-sugary version of the classic Cap'n Crunch. The cereal itself is shaped differently -- in fact, if this is even possible, the pieces are sharper in your mouth than the classic variation. Upon first bite, I realized that this indeed tastes exactly like what is advertised -- Cap'n Crunch with "1/2 the sugar of regular Cap'n Crunch." Translation? A bland mess in your mouth that slightly resembles a breakfast classic. This just in. Sugary cereals are not meant to be healthy. This is no different than sugar-free Kool-Aid. Low-calorie Oreos. If you take sugar away from a sugary cereal, you're left with nothing. In the future, I'll save my money and just chew on a piece of paper. What do you get when you show up for Record Store Day right when the doors open? 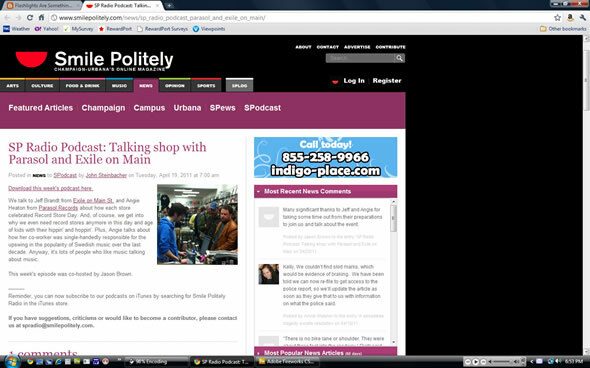 You get yourself pictured in a local online magazine basking in your music nerd glory. The guy in the blue hat? Yours truly. I'm pretty sure Record Store Day is one of my favorite days of the year, and at the same time, a day that I loathe. I love the idea of limited edition releases being made available in support of the nearly-extinct record store. But I hate crowds. Combine the two and you've got Record Store Day. Arriving at my local record store this morning exactly one minute after they opened their doors, I was met with shoulder-to-shoulder music snobs like myself searching for their short list of items available at that moment for the first time. My list this morning included three things -- a 7" from Justin Townes Earle and 10" and 12" releases from the Black Angels. 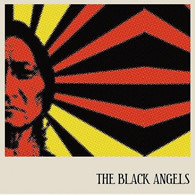 Looking for the Black Angels for my brother, my plan was to buy copies for myself as well if they'd allow me more than one. Standing on my tip-toes to see over the mass of people between me and the wall of Record Store Day releases, I quickly spotted the Black Angels 12". Good for my brother. Then I heard one of the store employees say something to another customer about "one copy per customer." Bad for me. With the store owner nearby, I decided to save myself a headache and just asked if he had copies of either of the other two releases I was looking for. He did not. Bad for my brother. Bad for me. Apparently, as the store owner said, the "powers that be" only allowed him a select stock of merchandise with no rhyme nor reason to what he was provided. That's all I needed to hear as I headed to the check-out line. It was time to get the hell out of there as quickly as I had come in. Total shopping time: nine minutes. You win this year, Record Store Day. I hate to come back after a few weeks away with a simple video link, but this is quite possibly the most awesome thing I've seen since the discovery of Andy D.